Deep in the throes of the New Marathoner High, and newly transplanted to Seattle after a lifetime on the east coast, I completed the Amica Seattle Marathon for the first time in 2014 on a day so cold it broke local weather records. A photograph of the winner, his beard crusted with icicles, appeared in the media. Some three years and 31 marathons later, I still tell the story of cold so debilitating that, despite double-layered mittens, I lost the use of my hands to Rinaud’s (a condition not uncommon in women in which blood vessels in the fingers close in completely, cutting off blood flow to one or more digits for a period of time) and, at Mile 18, implored a spectator, a stranger, to bite the top of my gel packet off for me because I couldn’t grip the package strongly enough to bite it off myself. I would pass my husband waiting to cheer me on at Mile 25, his hat pulled low and scarf piled high, with tears streaming down my face. I’m just so cold, I remember whimpering. He felt so badly for me he tried to chase me to the finish. The 2017 Seattle Marathon website boasted an expected 15,000 entrants across the half and full marathon distances, but the races would finish just under 5,000, amidst sideways rain and 43 degree temperatures. Soaked through every layer of clothing, including those ostensibly protected by my rain jacket and waterproof sneakers, my teeth began a literal chatter in the final race miles, and during the nearly two-mile walk home. It seemed a better idea to just keep moving, than to await an Uber trying to navigate Thanksgiving weekend downtown Seattle marathon traffic. I was just so cold. While I don’t ever ask myself why I run marathons, I have begun to ask myself why I run this marathon. Pirouetting in the shower, periodically checking to see if I can make the water hotter, even though the lever is turned as far left as it can go, I imagine I’ll run in 2018. They can’t all end like this. Photo-bombed by an umbrella. How very Seattle Marathon. A series of small, friendly races around metro Seattle during Thanksgiving week are big on smiles and low on fan-fair. 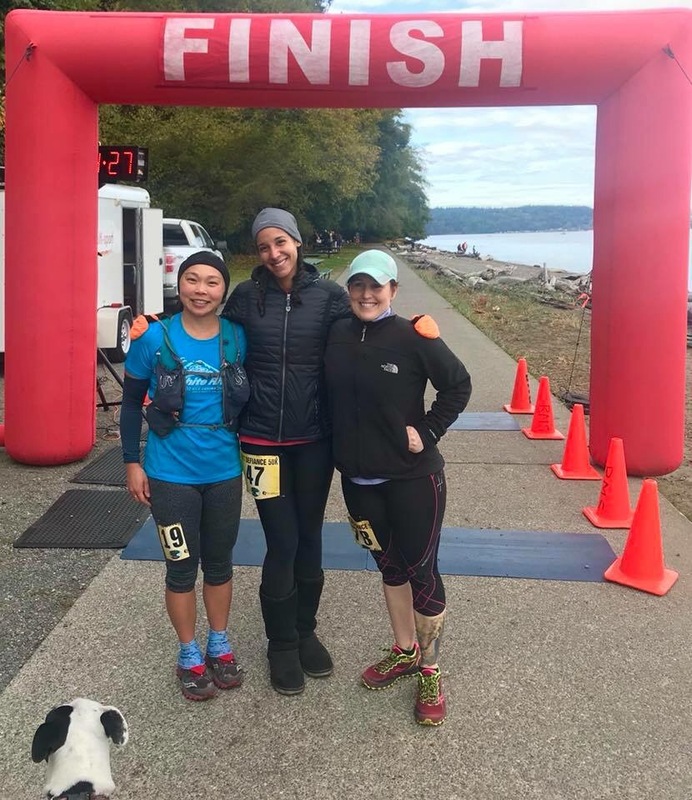 In one, the Balanced Athlete Half Marathon, participants are few enough to gather inside the Renton, Washington running store before the race, where they sip coffee and hot chocolate; and after the race, where they eat homemade cupcakes. The post-race carb load at the Balanced Athlete Half Marathon in Renton, Washington on November 19. The other, the Wattle Waddle marathon and Wittle Waddle Half on Thanksgiving Day, marks the first of four races known as the Seattle Quadzuki (4 halfs in 4 days), and Quadzilla (4 marathons in 4 days). Despite that feat of aerobic strength and mental fortitude (particularly in what is notoriously a terribly wet and cold race weekend in Seattle), racers and organizers remain in good spirits. Races 46 and 47 complete. Bring on the home stretch. Post Wittle Waddle Half Marathon. Thankful for my race swag. I remember learning about Rosa Parks as a child. A simplistic story of a black woman who refused to give up her seat on a bus to a white passenger, and it started a civil rights movement. As a child, I thought it was a story about a moment of strength. It was not until I got older that I learned the full story. That Rosa Parks got in physical fights as a child to protect herself, and was an active member of the NAACP a dozen years before she rode that Montgomery bus. It was a moment of strength that brought Rosa Parks to the country’s attention, but it was a life of strength that put her on the bus in the first place. I was reminded of this today while running with Kelly Herron. Google her, and pick one of dozens of results to learn how, while training for her first marathon earlier this year, she was attacked in a Seattle park public bathroom. Fighting for her life, all the while shouting “Not today, motherf**ker!,” Kelly escaped, stitched and bruised, and shared her story on social media. It went viral. Women and runners everywhere, including me, talked about “that runner in Seattle” and her moment of strength. Through profiles in Women’s Running, and through social media, Kelly and I connected online shortly before she completed the Chicago Marathon in October. But, given we are two strong women runners living in the same city, it made sense only that we would do one thing together: we would run. This race was not my longest or my toughest. It was on a course I’d run before, in weather stereotypical for Seattle in fall. But Race #44 was special. Over the course of the race, Kelly and I talked about running and working, the people we used to be and the people we are now. We cursed and we laughed, often at the same time. 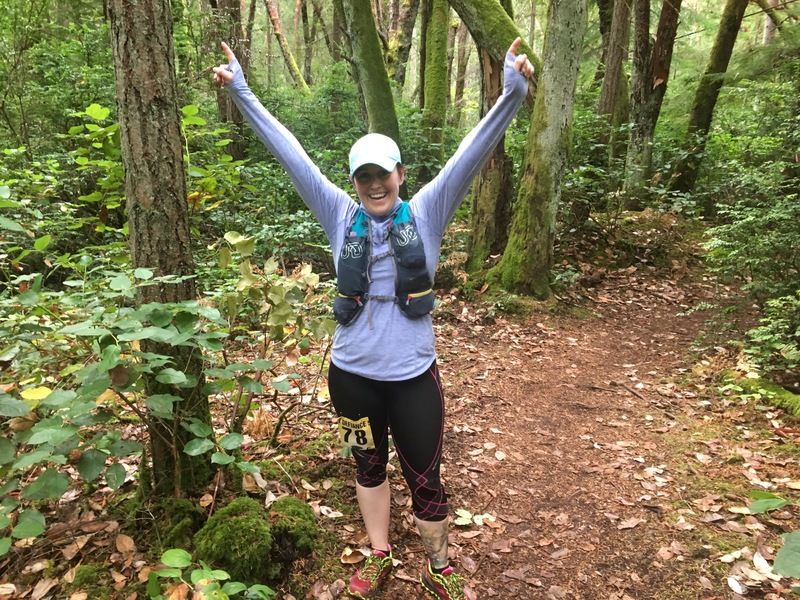 And as we crossed the finish line, Kelly’s first trail race completed, I realized that it was a moment of strength that thrust Kelly into the public conscious, but a life of strength that put her in that park in the first place. And I am honored she shared 5 miles worth of that extraordinary life with me. Kelly and I, at the start line of the five mile race. Anyone that knows me suspected this would happen. That I would not only meet my quest of running 40 races in 2017 for my 40th birthday, but that, upon doing so, I was unlikely to take a rest. In fact, as I approached 40 races on October 22, there seemed only one real answer to the question, what’s next? That answer is 52. For just a moment, the sun breaks through the fog at mile 7 of the Cougar Mountain trail 19.5 mile race on October 28. 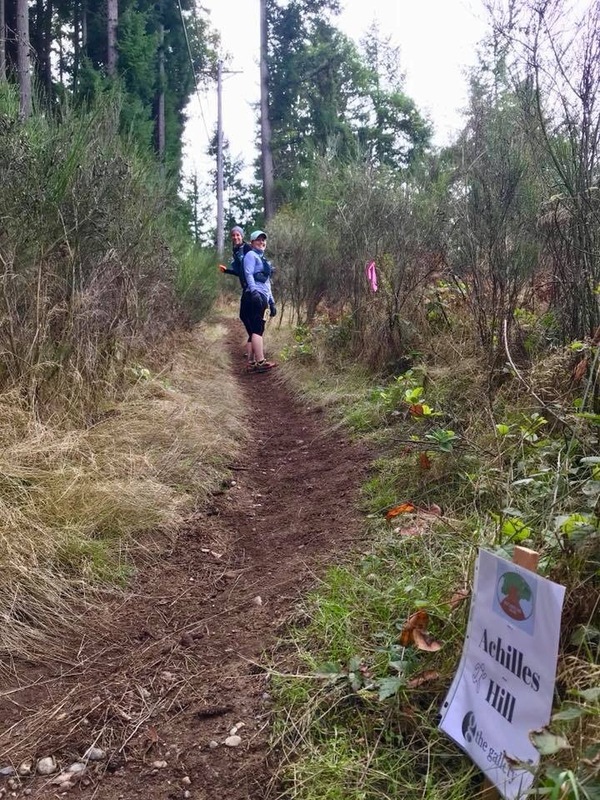 Race 41 was at Cougar Mountain in Newcastle, Washington, the same course I ran on July 8th for race 28, when I’d finished that race nearly 25 minutes faster than I’d run it the year before. On October 28, however, I shaved another 11 minutes off my time. 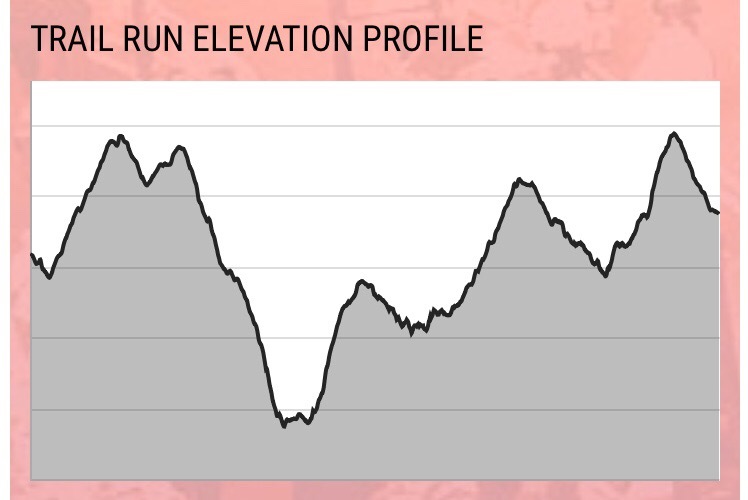 Still, it’s four hours on the race course with nearly 4,000 feet of elevation gain. Yet multi-hour races seem only to drive me to want to do more multi-hour races. I ran the following weekend’s In Unity We Run marathon in Kent for no other reason than it made me a 33-time marathoner. And, just one week later and 800 miles south, I ran the Mt. Tam 30k in Stinson Beach, California. The view from the top of Mt. Tamalpais, in Marin County, California. Fifty-two is definitely within reach. Athletes are superstitious. It is reported that Michael Jordan wore his University of North Carolina shorts under his Chicago Bulls uniform while leading the team to six national championships. So when I picked up my race bib for the Runner’s World Grand Slam — races 37-40 on the year — and found it was actually my birthday (I was born on August 23), I took it as an excellent omen. After three races in two days, we are ready for race number four – the half marathon. I gave myself the calendar year to complete this challenge. My birthday was in Week 35, which meant I would have to have raced more than once a week to meet 40 races by that date. I was afraid that such an aggressive racing schedule would turn the challenge from something fun to something tedious. While, in hindsight, I could have hit 40 by August 23, completing the challenge in Bethlehem, where I’ve raced in every Runner’s World Half since the race’s inception 6 years ago, was an obvious finishing point. 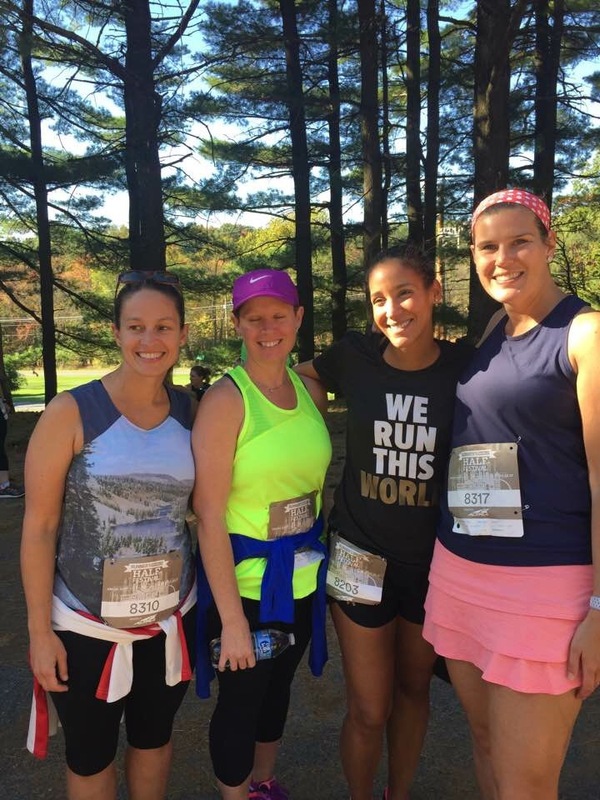 A northeast race also meant that my east coast girlfriends and family could take part with me. Mom, Dad and I post-race. Six years ago tonight, I sat in this same hotel, in a bed just like this one. I ordered spaghetti with grilled chicken, red pepper flakes and olive oil from room service, seeking to recreate the pre-run meal I’d grown accustomed to at home. It wasn’t on the menu, but the kitchen obliged. When it arrived, however, something in the chicken smelled like bleach. I ate cautiously, only until I felt like I had enough calories in me, and tossed the rest in the garbage. And, before bed, I successfully convinced the gentleman that delivered my room service to steal real half and half from the staff break room for me, lest I have to drink my coffee with the powdered cream offered in the room on race morning. I would not let anything, real or perceived, come between me and the personal record I’d spent 12 weeks training for. Me and Runner’s World Editor and 1968 Boston Marathon winner, Amby Burfoot, after completing my first Runner’s World Half Marathon in 2012. I crossed the finish line of the 2012 Runner’s World with a five-minute PR, and the 2013 Hat Trick — a 5k, 10k and Half Marathon over two days — in my sites. I would complete that too, along with the Half Marathon in 2014 (another PR), and the 10k and Half Marathon in 2015 and 2016. Tonight, I sit in front of the television watching a movie. I went out earlier for a proper dinner. Tomorrow will be race #40 on the year. I am not the same person that I was in 2012, when a half marathon was a daunting endeavor. In the last six years, I’ve run days through the Rocky Mountains; I’ve run marathons on three continents; I’ve run 100 miles without sleep. But I’ve always come back to where I feel like it all began. I’ve always come back to Bethlehem. The 5k is the entry-level distance. The race that gets people off the couch. The race a friend talks you into over a third drink and it seems like a good idea. For those like me who prefer longer distances, the 5k hardly provides time to warm up before it’s over. For others, it’s the perfect distance to push for the entirety. 1500 runners gathered at the start of the Runner’s World 5k. The 27 year old winner of this morning’s Runner’s World Grand Slam 5k crossed the finish line in 15:56. Before the clock ticked to 40:00 minutes, my 70 year old mother also crossed the finish line, first in her age group, my aunt and mother-in-law, just minutes behind her. My mother-in-law and aunt, weary, but pleased with their finish times. For some, the 5k is a challenge. An occasional reminder they are capable of difficult things; the burning lungs and quads quickly forgotten. And the reward, be it T-shirt or pint glass or medal, is always sweet; made sweeter by family. My mother-in-law, mom and aunt, celebrating their finish. Four races. Three Days. 26.2 total miles. A journey will culminate in Bethlehem. 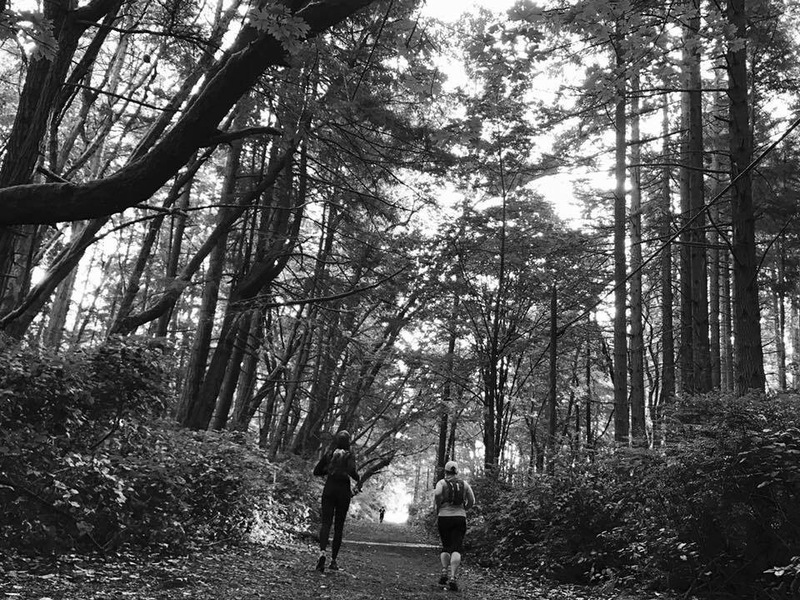 My girlfriends and I are just a few of the several hundred people gathered on a Friday afternoon for 3.8 trail miles in Bethelhem’s South Mountain Park. 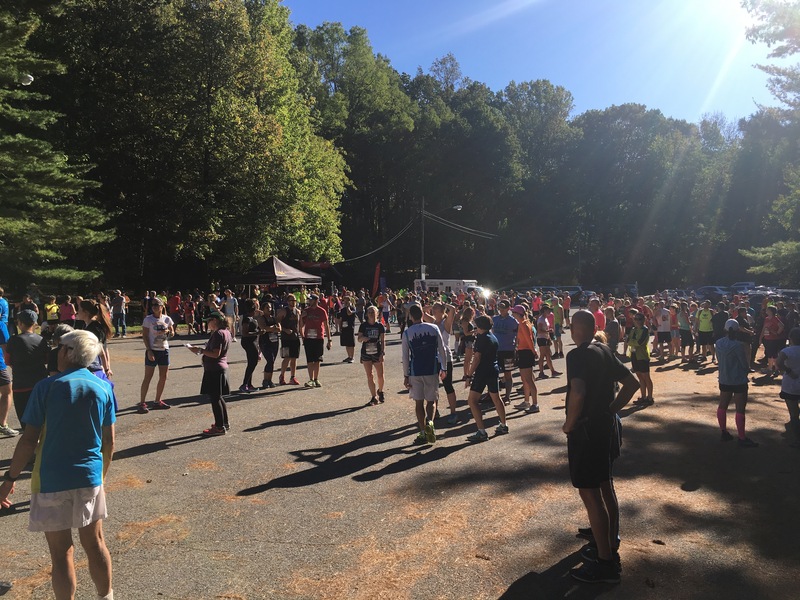 We will all complete the Grand Slam – 3.8 mile trail race, a 5k, a 10k and a half marathon over three days. The gravel and single track trail undulates, with nearly 600 feet of climb. It’s over quickly; I’ve rarely run anything shorter than a half marathon all year. 3.8 miles feels like a warm-up. In a way, it is. Because just 16 hours after finishing the trail race, I will line up at the start of race #38. The journey culminates in Bethelehem. The GirlSquad, descended on Bethlehem from Massachusetts, New Hampshire, South Carolina and Washington State. I entered Nicole’s house through the garage at 7:11am, 11 minutes after I’d planned to arrive, but with 19 minutes to spare on our 7:30am departure. Plenty of time, I knew, to use her bathroom; I’d change into my running sneakers on the way to Defiance Point, ten minutes away. 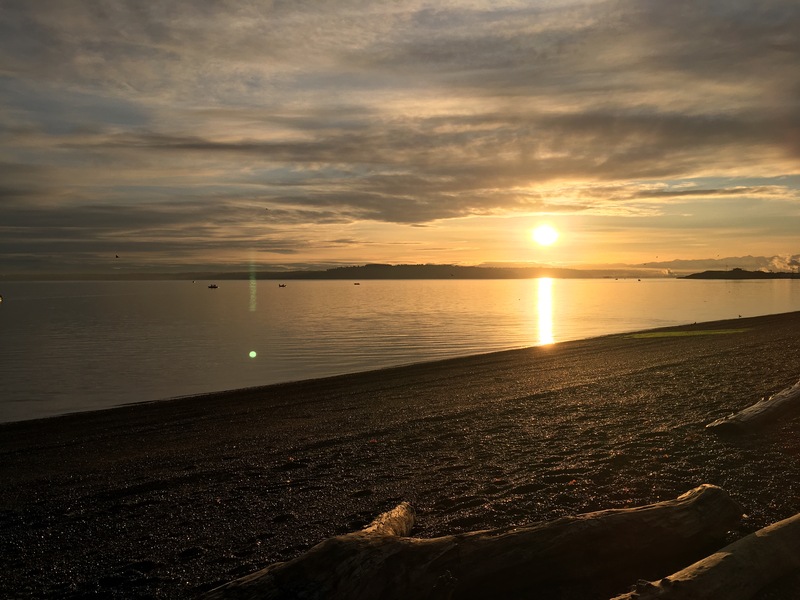 The sun rises, casting a golden light on Defiance Point in Tacoma, Washington. As I pinned my bib onto my right thigh, I watched Nicole roll her calves on an acupressure ball. On the couch, Nicole’s friend Jessie appeared completely ready for this, her first 50k. I am calm to the point of near disorganization on my penultimate race weekend. Races #37-40 will come over three days at next weekend’s Runner’s World Grand Slam in Bethelehem, Pennsylvania. Nicole snaps a photo of Jessie and I from behind. I carry out my duties as Pacer In Chief; Nicole plays paparazzi. To get here, I’ve completed 5 ultra-marathons, including the Defiance 50k: 3 50ks, 1 100k and 1 81 miler. Along with 7 full marathons; 3 races between 15 and 20 miles; a dozen half marathons; 7 10 and 15ks, a 10.8 miler, and a lone 5k in January. Jessie at mile 26.21, celebrating the moment she’s run farther than ever before. I imagine this is how a veteran comedian feels. There are still nerves before the curtain goes up, but I know exactly what I’m supposed to do when it does. I cross the finish line, and wonder whether this will be my last ultra of 2017. For now, my mind is pointed towards Bethlehem, and towards 37, 38, 39 and 40. Nicole, Jessie and I at the finish. Next stop, Bethlehem. “Mirabelle! Mirabelle!” I shouted and waved my arms, willing her to see me from the other side the street where she was closing in on her final half-marathon miles, at a strong, 7:21 per mile pace. Saturday morning I board a float plane in Seattle, bound for Victoria, British Columbia, just 30 minutes away. She grinned, confirming that she’d seen me. It would be hours before I reached the spot where she now was on the out-and-back course, as I was going twice the distance, and at a slower pace. As the marathoners began to approach, I watch first for pace groups — groups of runners led by the Super Pacers, with their star placards announcing the group’s marathon finish time. 3:40. 3:50. 3:55. I began studying oncoming runners in earnest. Cathy had a 3:55 marathon PR, and she was trying for another one in Victoria. Then, the blond pigtails I recognized, high on her head. “Cathy!” “Jenna!” “Cathy!” “Jenna!” We high fived over the double yellow lines in the center of the street, squeezing one another’s gloved hand before letting go to continue on our way. Cathy would finish in 3:53, a personal record. With race-time weather forecast at 51 degrees and sunny on the waterfront course, I make the decision to trade in my half marathon bib for a full marathon bib at the expo. Mirabelle and Cathy were the only reason I was even at this race; the beautiful race weather the only reason I was running the full marathon, rather than the half I’d signed up for. And, with a 50k just six days away, I wasn’t trying to accomplish anything significant in Victoria. Cathy, Mirabelle and I, with four other amazing women, at trail running camp in Colorado over the summer. We met here, and have stayed close through social media, and encouragement for our individual athletic endeavors. Post-race brunch is filled with catching up (we’d not seen one another since we’d departed trail running camp in July), french fries and croque-madame, before I board the float plane for the 30 minute flight back to Seattle. Mirabelle and I promise to make plans to get together, as only 3 driving hours separate our Seattle and Vancouver homes. Cathy, I will see in December, where she will travel from Mississippi to pace me at the Kiawah Island Marathon, as I am training for a sub-4:00 finish, a 13-minute PR. Some friends, I realize, plan shopping excursions as a reason to see one another. Mine plan race excursions.